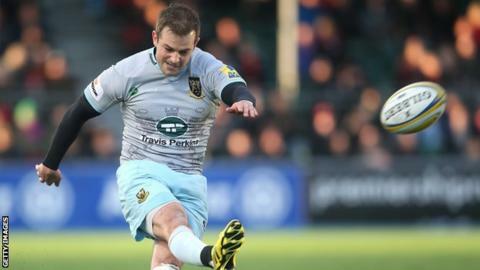 Stand-off Stephen Myler helped Northampton Saints make it four wins from their last five Premiership games to beat league leaders Saracens. Myler's try and 10 points with the boot, added to a score from Lee Dickson, ensured Jim Mallinder's side edged a hard-fought contest. The hosts were unable to get over the line, with Ben Spencer and Alex Goode landing their five penalties. Saints lost England lock Courtney Lawes to a suspected ankle injury. That defeat leaves Saracens three points above Exeter, who play Leicester on Sunday, while the Saints move up to fourth. There was opportunity for players on both sides to make an impression in front of England coach Eddie Jones. However, the windy conditions and a lack of composure made it difficult for Jones to truly assess the players on display. Full-back Goode showed his class in glimmers amid the lack of rhythm, but the absence of Charlie Hodgson hurt Mark McCall's side, notably when scrum-half Spencer was sin-binned before the break. Ben Foden might have scored a third try for the visitors but knocked on in the process of scoring, and Saints held on to pick up four precious points. "We got away with a bonus point, and we move on to the next game. We've asked a lot from this group in the last few weeks, the physicality and the intent was there, which is pleasing, but we were undone by the small things. "In terms of the big stuff that you require week in week out, we were good. We just got the small stuff wrong, the details - knocking on three balls in good positions. "This is a tremendously challenging period for us and it's been tough. Despite the fact we lost, I think we are going to be ok. We are all in the race to get into a top four spot and hopefully we have enough, especially with the cavalry coming back, to stay there." "Any win down at Saracens is good. Even with their international players away it's a good win but I think it could be a different game come the European Champions Cup. "I think our performance, particularly in the first half, was very good. And we came out in the second half and Dickson scored. "We're slightly disappointed we couldn't finish off the (Ben) Foden opportunity but we are generally happy." Saracens: Goode; Ellery, Taylor, Barritt (capt), Wyles; Mordt, Spencer, Barrington, George, Du Plessis, Smith, Hamilton, Rhodes, Brown, Wray. Replacements: Marshall, Waller, Hill, Craig, Dickinson, Kessell, Hanrahan, Mallinder.